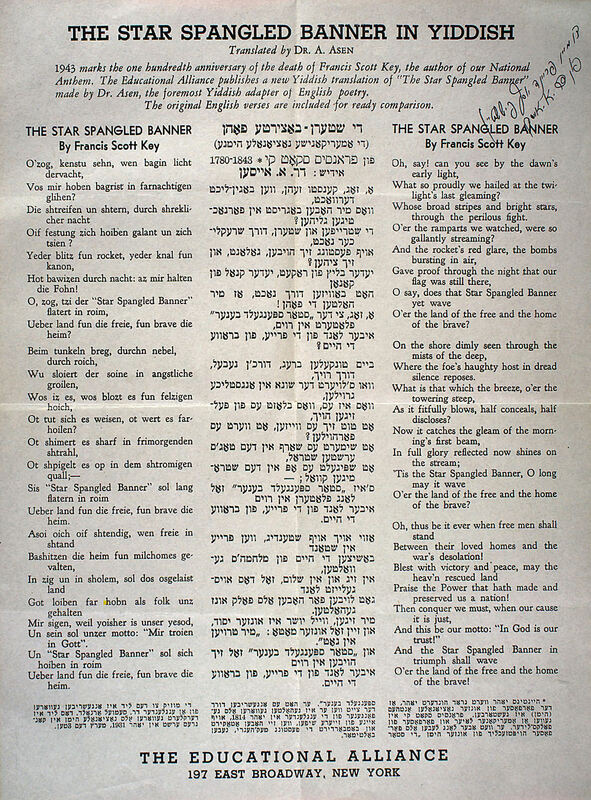 Shown below is the translation of "The Star Spangled Banner," in Yiddish called “Di Shtern-Batsirte Fon” by Yiddish poet Avrom Aisen. The translation was published in 1943 by the Educational Alliance located on New York City’s Lower East Side. The translation was done to mark the hundredth anniversary of the passing of Francis Scott Key, the author of the poem. Dr. Aisen was a native of Brisk, Poland (now called Brest, Belarus) who immigrated to the United States via New York in1903. Beginning in the 1920s Aisen spent a good deal of time translating the works of such poets as Byron, Tennyson, Longfellow, Whitman et al.